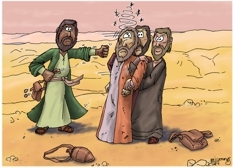 Three robbers or bandits & the Hebrew victim. 01) (Previous page) Luke 10 – Parable of the good Samaritan SET01 – Scene 01 – Beaten up. 02) (This page) Luke 10 – Parable of the good Samaritan SET02 – Scene 01 – Beaten up. In SET 02, I actually finished scene 03 – Good Samaritan SET02 in 2015 first, before I finished the other scenes. Scene 03 was a special commission for a local primary school, so it was needed first. I have just completed colouring up the other 4 scenes in this set, & made available on the BC website. The primary school wanted 4 large canvases with my illustrations on, each highlighting one of four values of the school. Apparently the canvases have been well received & are helping to illustrate the Christian ethos of the school.